Would you pay $25 to fish “closed waters” and catch huge Kings like the one pictured below all day long for three days? 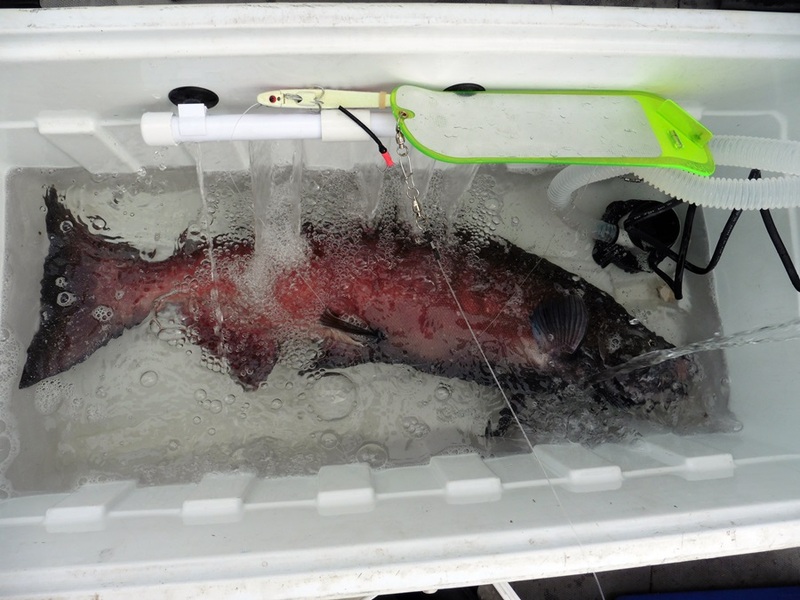 A huge “Upriver Bright” approaching 40 Pounds! 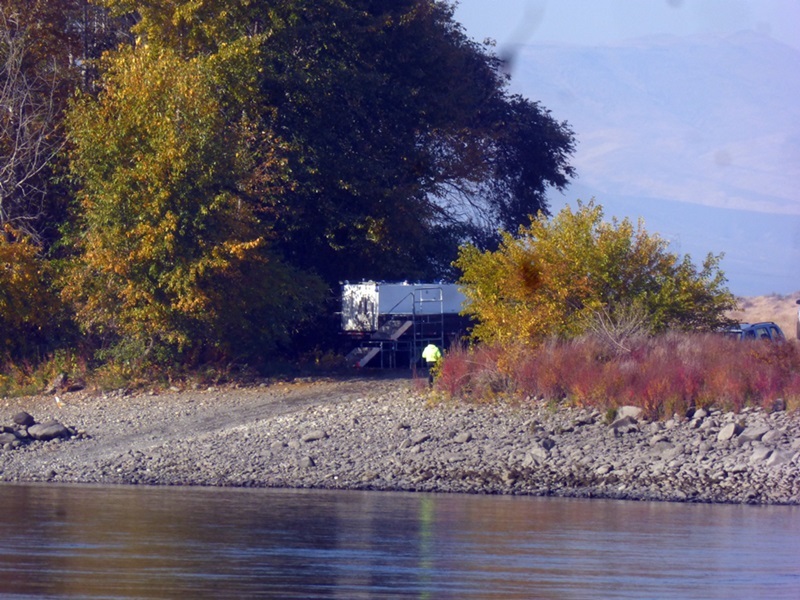 On Sunday October 29 I was very lucky to be able to fish in the “King of the Reach” Salmon Derby at Vernita Bridge. I was a guest of Chris Tannahill of Atomic Anglers Guide Service and his friends, Chris, Kevin and Mike. This Derby is jointly sponsored by the Department of Fish & Wildlife (WDFW), Grant County PUD, and the Tri-Cities Chapter of the Coastal Conservation Association (CCA). The purpose of the Derby is the live capture of “unmarked” adult Kings, so that they can become part of the WDFW’s brood stock program. The goal of the brood stock program is to increase the gene pool used in the production of hatchery Kings. However, these are not just any King Salmon; these are the famed “Upriver Brights” (URB’s). URBs are King salmon that predominantly spawn at or above the Hanford Reach area of the Columbia. These fish are known for their extremely large size, some reaching over 50 pounds! Additionally, these Kings are extremely strong because they have to fight their way back up Columbia all the way to their spawning grounds. Genetically, they have adapted to this long journey from the ocean and while their skin colors up; their meat stays in prime shape into October. The Vernita Bridge is a short 155 miles from the intersection of I-90 and I-405. Most of the way the speed limit is 70 MPH on the Interstate and 55 MPH on the State Route 24, so I made the trip there in less than 3 hours. We launched just before daylight because the best bite is early in morning. However, we need not have been worried because there were lots of fish there and they bit all day! Also, if you have never fished a Derby in eastern Washington before you are in for a real treat. The people there are really friendly and there was less than 3 dozen boats fishing there, so the ramp was never crowded. Additionally, when you registered for the Derby, they had muffins and candy to energize to reel in lots these big fish! Then later in the day, they brought you cooked gourmet hot dogs when you “landed” your fish. You never even had to get out of your boat! I have never seen that at a derby before! 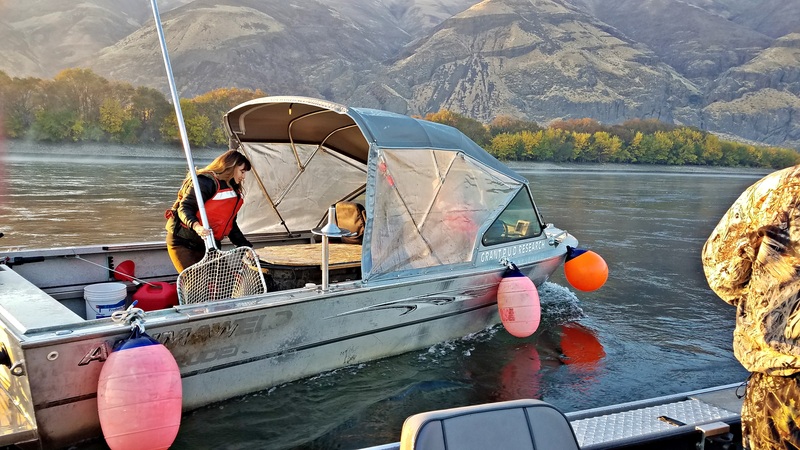 This section of the Columbia River is just upstream from the Vernita Bridge and if you can “read river water” it is fairly is extremely easy to navigate with a boat with a prop all the way up to the Rapids. However, if you run downstream below the Bridge, you might want to follow someone knowledgeable with the river unless you have a boat with a “Pump”. Also, keep in mind the river level is regulated by discharge from the Priest Rapids Dam which is just a short distance upstream from the Bridge. When electrical power needs rise during the day, the Dam dumps more water. Both the current and river level can increase very quickly. So when launching, never park your rig close to the river or you may return to find it under water. Additionally, when assessing the condition of the unpaved launch, consider the affect a water depth change will have on it. After launching, we ran in ran in the fog upstream to the Rapids. There we fished with sardine wrapped Brad’s Killer Fish size 15 and a jumbo jet diver. I was indeed very lucky that day, as I managed to hook and the land the first URB of the day. 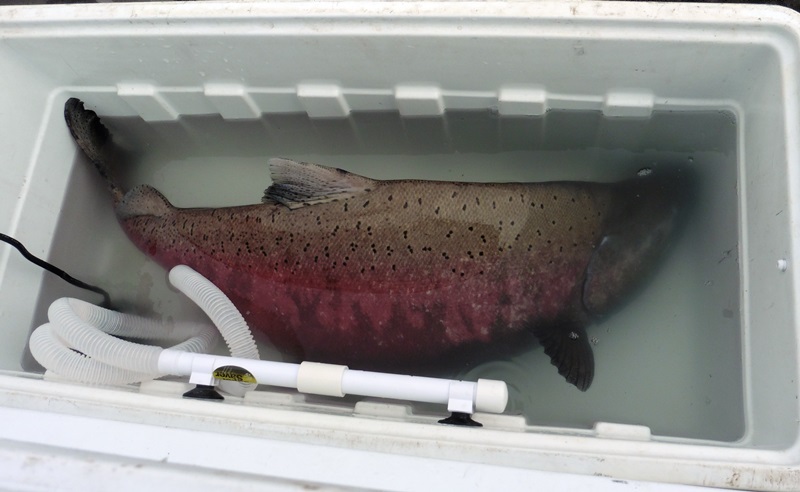 It was not a large fish but was still useful because the WDFW biologists at the hatchery want a diverse gene pool. The “chase boat” with a holding tank. Due to the distance from the launch there are “chase boats” that come and pick up your fish for a more rapid transfer to hatchery tanker truck. The bite died after about an hour and we ran downstream to the deep section of the river and started to troll downstream. Our rigging method this year consisted of a “sliding” 10-ounce cannonball weight on 50-pound braid mainline. Then to our terminal swivel, we attached a 24-inch section of braided wire. This is called a “bumper” and separates your weight from our Pro-Troll flasher. This separation allows the flasher to turn and also reduces tangles. Note: I say reduces tangles, you need to let is rig out extremely slow to minimize tangles. Like just about everyone else in Eastern Washington, we used Pro-Troll flashers with Agitator Fin (it is called a Pro-Chip -11 flasher). Everybody at the Derby said that was the standard “go-to” flasher on the Hanford Reach because the Pro-Chip flasher with the Agitator Fin will rotate at speeds as slow as mile an hour, while other flashers will only rotate at speeds at or above 1.8 MPH. This ability to rotate at slow speeds is the key to everyone’s success. An example of the Pro-Troll flasher and Brad’s Rig! Next, we attached the Brad’s Original Super Bait using a 36- inch leader of 40-pound mono using two barbless hooks. Then you open your Super Bait and fill it with your choice of baits. In our case it was canned tuna that is was packed in oil. Normally, you have to pull your gear and refresh your bait often. 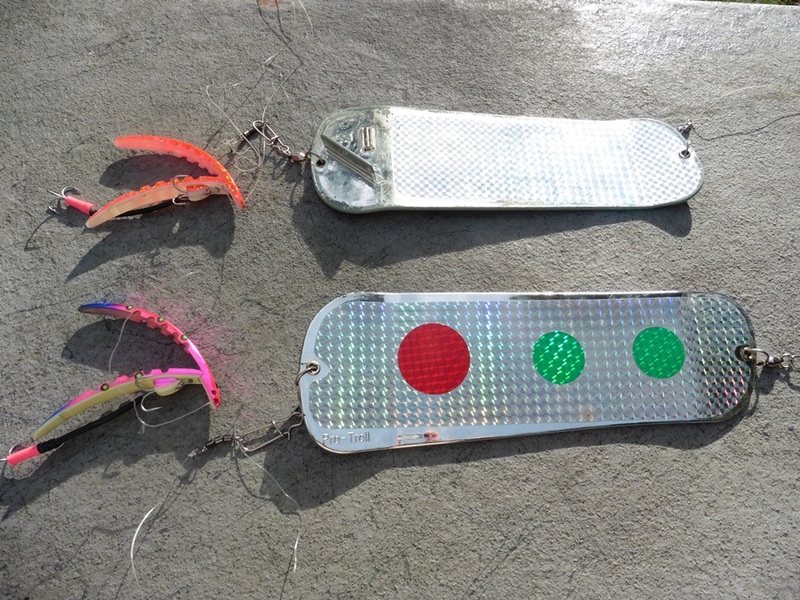 Most our fish came on the Chrome (Model #700) and White Glow (Model #102) Pro-Chip 11 flashers. For the Brad’s Super Bait it was much more varied. We used both Original Super Bait and Super Bait Cut Plug in the 4.0 size. Lady Bug, the Hot Tamale or Hotter Tamale all worked. Once you get a fish into the net, you need to treat it gently. If you do not have a live well in boat but bring a big cooler and the WDFW staff will loan an aerator pump with battery clips. WDFW Tanker Truck at the launch. 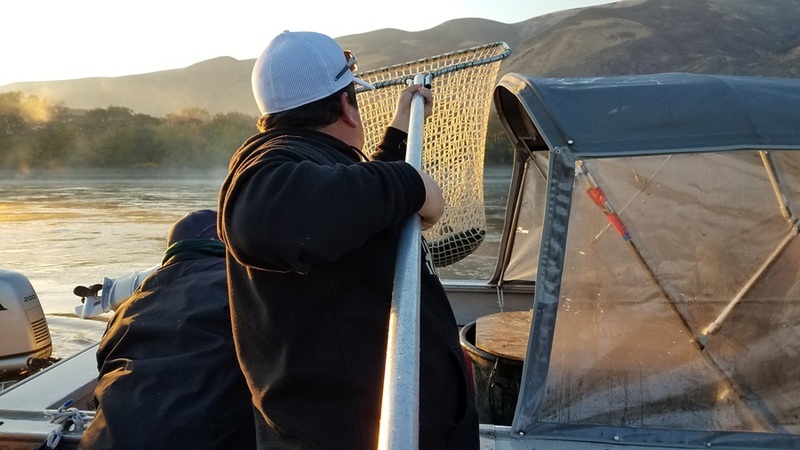 The contribution the “King of the Reach” makes to the Columbia River fishery cannot be understated. Here is the break down as to the number fish collected for the brood stock program during the Derby. Also noteworthy is that in this year’s Derby, 3 boats turned in more than 30 URB’s per boat and more 3 more boats turned in more than 20 URB’s per boat. Wow, that is fishing for a cause! The “King of the Reach” is tentatively scheduled for October 26-28, 2018. You must put this event on your 2018 calendar because you will have a great time and meet a lot of nice people! FYI: For those anglers who want to use a paved ramp, they can also fish in the Derby at the White Bluffs boat launch. The White Bluffs boat launch at the old Ferry Landing is 180 miles from the intersection of I-90 and I-405. One word of caution is that if you have never been there before, when on SR-24, slow down well in advance of the turn off into the Hanford Reach National Monument. Watch for Mile Post 63, and the right turn is about two tenths of mile past that. There is also small sign on the side of the road but I cannot see it in the dark. 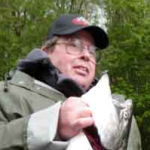 Mark Gavin is an expert and dedicated salmon and steelhead fisherman covering the Northwest and British Columbia. Part of the Pro-Troll pro staff, he is a popular seminar speaker and member of several Puget Sound Anglers chapters.